The roar of motorcycles, the smell of burnt rubber, and a sea of leather – it’s all a sign that Biker Sunday is here. Biker Sunday is an annual event that we began many years ago to reach out to motorcycle enthusiast in our region. 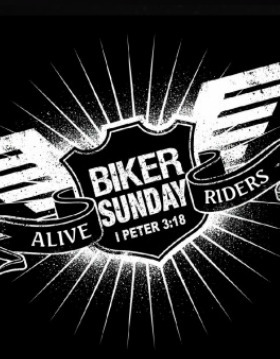 This year we are joining together with our North Church for Biker Sunday! We will begin at our Jamestown location at 10am (126 Mercy Lane, Jamestown, TN). Following the service we will ride to our Byrdstown location (5645 North York Hwy, Byrdstown, TN), where we will have free food, live bands, and lots of family friendly activities! It will be a fun day of fellowship, so don't miss it! If you need further information please call us at 931-879-4971! 2018 BIKER SUNDAY will be August 5th!